Length: 9 hrs. 45 min. Overscheduled. Exhausted. Overwhelmed. Sound familiar? Too familiar? You are living at a velocity you know deep down is unsustainable. Your life is off course — too crammed with busyness, too out of focus. You keep waiting for things to get better, but they never do. 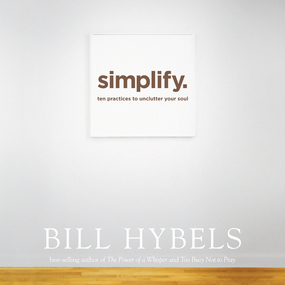 In Simplify, best-selling author Bill Hybels identifies core issues that drive this kind of living and offers action steps to help you live a better way. By eradicating clutter from your inner world, you can experience immediate rewards: greater energy, clearer purpose, richer relationships, and more. Your life won’t simplify itself. You must act. Isn’t it time?